Having not seen this wagon with pneumatic tires that we picked up at a yard sale well over a decade ago, it has resurfaced as an all purpose tool on the farm. I found it coated in dust in january with flat tires. Flat tires magically appeared filled and even more magically, holding air when I came back in February. What is responsible for this was either a miracle or more likely my dad noticed at the end of hunting season that I was using it and filled the tires for me. Thanks! It has served as a sawhorse for the entirety of brooder construction while also doubling as a tool carrier. Well, more importantly it was a clean space where I put any tool that was not in use. I commonly lose a tool I could have sworn I was still holding being unaware that I had subconsciously put it down. It has also served as a box carrier for my turf-killing cardboard liners while building garden beds. It has carried the ancient hay/straw left in the barn’s feeder to be used as mulch on the garden beds. I even hopped in it and rode down a slight grade. My dad has installed a towing hook with pin and clip allowing it to be pulled with the 4 wheeler, albeit at an excruciatingly conservative pace. 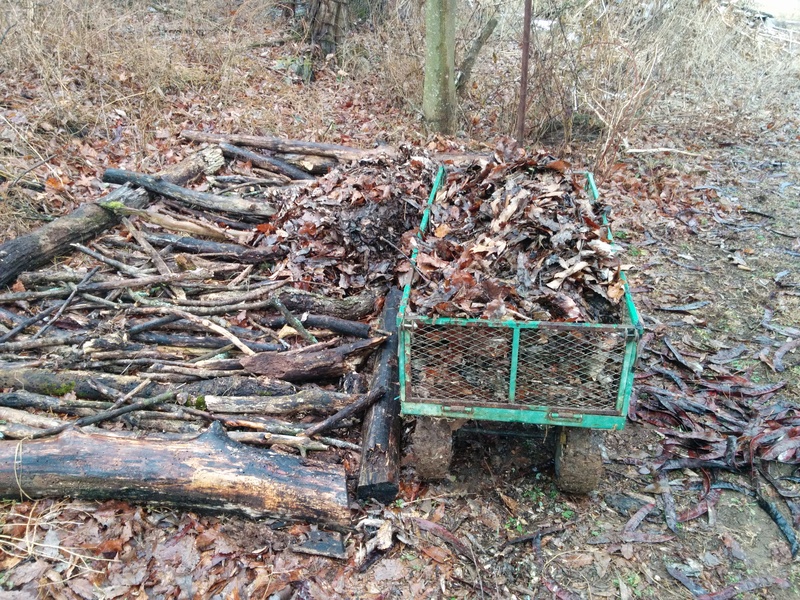 It has carried hundreds of pounds of leaves I cleaned out from places in and around the barn to get the compost pile started. Granted, a working wheelbarrow would take over most of these tasks. I do not have one and see no reason to buy one! Mentioning the pictured project previously, I followed up with neither a post nor pictures. Over time, I had been slowly gathering downed limbs from the pasture to clear the path for the chicken pens. 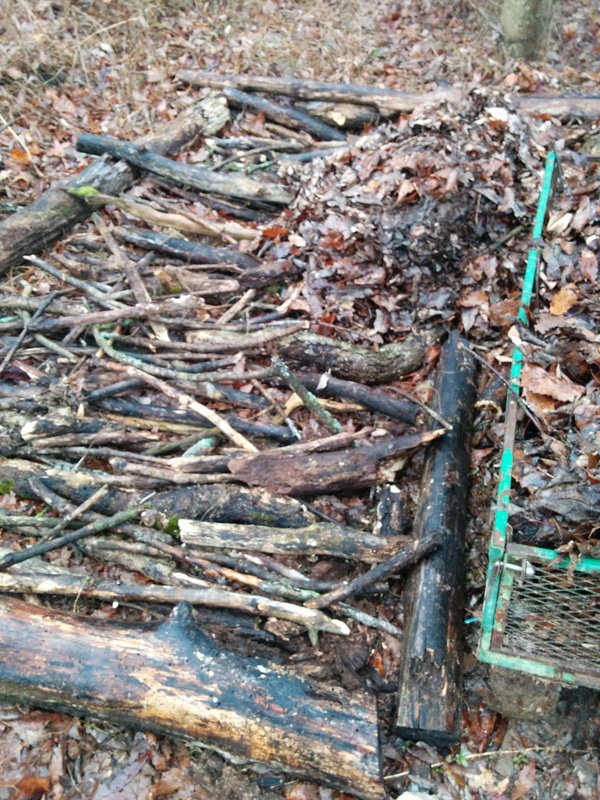 Using the accumulated wood, I built the base for the compost pile. Limb-lined bottom allow a bit of oxygen to get under the organic matter aiding in the composting process. …I hope, I was really just winging it to find a use for the tree-litter and that sounded intuitive. Mushroom farming was another consideration, but it seems pretty important to have host logs that aren’t inoculated with wild fungi already that would outcompete desirable mushrooms. So there you have it. Others being worm colonies and animal waste/bedding compost, here is the last member of the trifecta that creates soil fertility on my farm.